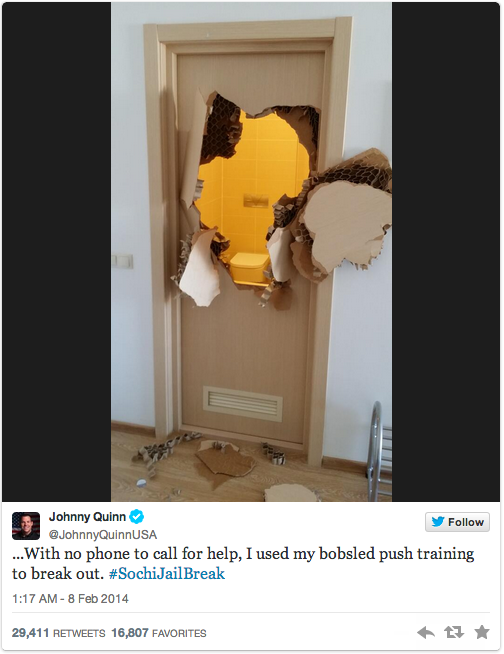 Image from Johnny Quinn’s Twitter feed. We may not all be 6-foot, 220-pound athletes with only a door standing between us and a towel, but we all have challenges. When life closes a door, bust it open with whatever resources you have. There aren’t many athletes who would give up a chance to win a medal, even if it was a long shot. Rather than putting himself first, speed skater Gilmore Junio did what was best for everyone else. Although he qualified for the 1,000m short track race, he gave the honors of competing to his teammate Denny Morrison, whom he said was skating better. “Although (Junio) qualified for the 1,000 metres, he knows Morrison is our best skater in this distance. He did it to give our team the best chance to win a medal,” Antonio Faiola the team spokesman told the Canadian Press. It was the right call; Morrison took home a silver medal. People recognize Junio’s sacrifice and there is now a movement to let him carry the Canadian flag during the closing ceremony. Jeremy Abbott didn’t leave with a gold. In fact, his fall during an attempted quadruple toe-triple toe combination ensured he would depart Sochi medal-less. But after his painful collapse he got up and finished his routine, inspiring us to do our best and earning the respect of people worldwide. “I’m not in the least bit ashamed,” Abbott said. “I stood up and I finished that program and I’m proud of my effort and I’m proud of what I did under the circumstance.” Let’s strive to have pride in our best efforts, no matter the outcome. To learn more about the Olympics, read New Technology Behind the Sochi 2014 Winter Olympics. « 5 Gift Go-To’s: A Valentine’s Craftacular!